The typical green bell pepper, about the size of a large fist. Very mild. 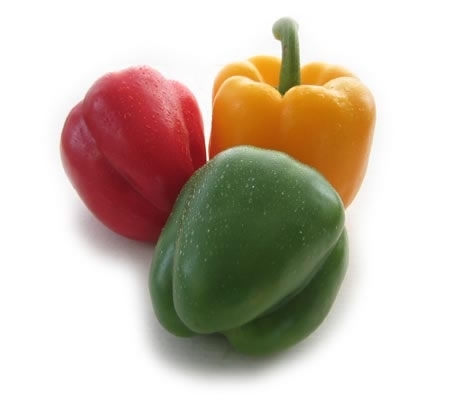 Bell peppers are found in an array of bright colors, as shown above. While they can vary in flavor, bell peppers are not hot or spicy, like most other peppers. Color and flavor are determined by the variety of the pepper plant and the stage of ripeness when picked. For example, a red bell pepper is simply a mature green bell pepper. Try some of these recipes for cooking and enjoying the most bell peppers have to offer.